The ENG3U – Grade 11 English class is approaching the middle portion of Macbeth. This is the point where the main characters really start to develop as the conflict and plot move upwards and onwards. It’s time for our class to dig a little deeper into the play to look at how the language, events, and narrative elements are all contributing to the story. We are going to go back to the seminar model to accomplish this. First, students will read the scenes of Act 3 in class. Students will then work on annotating their texts, covering them with sticky notes with their thinking. Students will then work in groups to put their thinking together on chart paper. 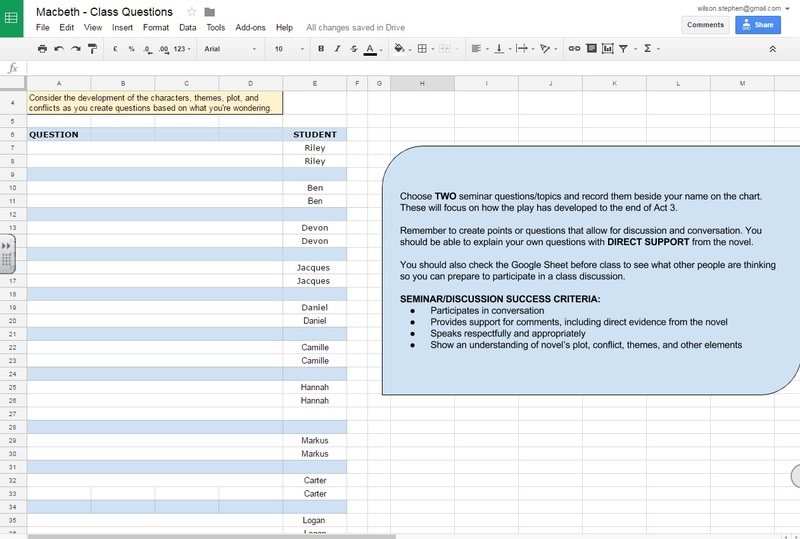 Finally, students will post two seminar questions on a Google Sheet so we can discuss them next week!